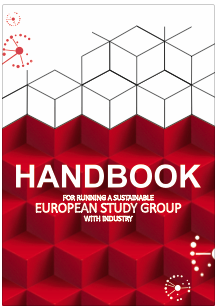 The ‘Handbook for running a sustainable European Study Group with Industry’ aims to compile the knowledge and experience acquired to date throughout Europe. The European Study Group with Industry (ESGI) format is an internationally recognised problem-solving forum for knowledge exchange between mathematical scientists and industrialists. Request hardcopy by contacting us. Supplementary information:templates for Academic Feedback Form, budget, Delegate packs, event checklists, Industry feedback form and Template attendance list. Sample flyer and letters promoting ESGI to Academicsand Companies. Contributors: Dr Katerina Kaouri (Cardiff University, UK), Dr Maurizio Ceseri (Sportello Matematico per l’Industria Italiana), Dr Ellen Murphy (University of Bath, UK), Prof Poul Hjoth (Technical University of Denmark), and the many previous hosts and participants in ESGIs, whose knowledge and experience we aim to document here for the next generation of industrial mathematicians.